Weather has been nice is a series of generative videos in which vintage found postcards are slowly broken down into their basic elements. Mailed from around the world, with their exaggerated colors and iconic images, these commoditized stereotypical landscapes are non-places – at the same time unknown and familiar. A pixel sorting algorithm manipulates the postcards, lunging them into movement, and generating a dynamic glitch that slowly decomposes into the dominant colors. The custom made application triggers a transformation, creating a system where the elements are continuously regenerating and composing new images. Weather has been nice presents us with images unfolding, becoming images. By appreciating these postcards as an instant that unfolds, and revealing its interwoven nature, we become aware that landscape, like memory, is not a fixed static entity outside of ourselves, but rather an intimate experience in constant transformation. The wall tapestries render visible the dialectical relation between analog and digital in Weather has been nice. The vintage found postcards found in flea markets are digitized to be decomposed by a pixel sorting algorithm, creating an ongoing process of recomposition. 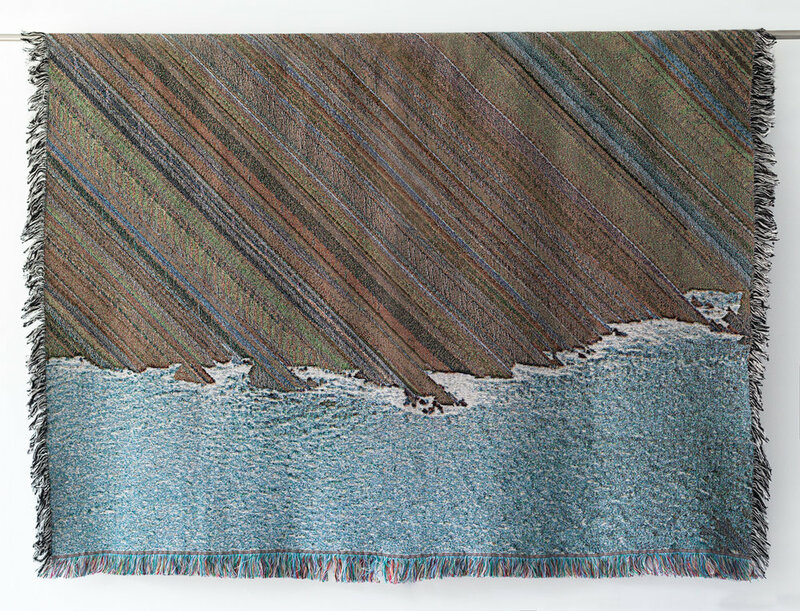 From this transformation, still images are selected to create textiles using jacquard looms. In its analog form, the weft of the tapestry depicts the grid of pixels that constitute the digital image, connecting to the origins of computing in machine weaving, like the punch card used in mechanical looms, which was the first format of digital image storage. The custom made application triggers a transformation, creating a system where the elements are continuously regenerating and composing new images. Every postcard reacts differently according to its own pixels. Each piece presents one postcard –from an extensive archive– manipulated and decomposed in a unique way.